The visual sequence puzzle is a sequence with a difference! Rather than the standard mathematical sequence, these are visual pattern based puzzles. Solving the puzzle requires the puzzler to see the common link or pattern between each different visual graphic in the sequence. For instance, there could be a series of dots that move in some specified pattern (for instance one dot is reflected in each frame whilst another moves round the four corners of a square). These are excellent puzzles that test both logic and the ability to spot patterns in a graphical form. 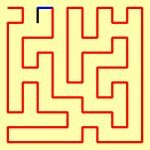 You may have come across puzzles similar to these before if you have ever been unfortunate enough to have to do an aptitude test as part of a job application! If you are looking to purchase visual sequence puzzles for print publication in a puzzle book, magazine, newspaper or indeed even for online publication, then we have a range of visual sequence puzzles available for purchase.